This book presents a comprehensive analysis of current trends of trade and economic growth in Asia, assessing how they are likely to develop in the future. 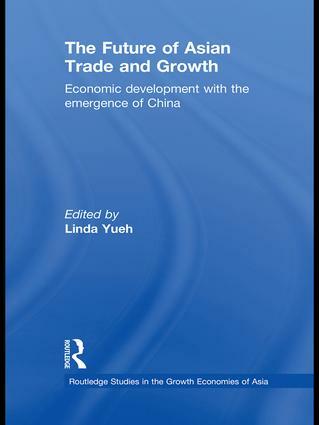 It examines the evolving patterns of Asian economic development with the emergence of China, including since China’s accession to the World Trade Organisation (WTO) in 2001. It is written by experts specialising in economic growth and regional and global trade/investment issues, alongside country specialists who have examined the development path of Asian economies. It discusses the significance of a export-oriented growth strategy on the Asian region, and the likely patterns of intra-regional specialisation given China’s rise. The book examines the degree to which the remarkable growth of China is likely to affect other Asian countries in terms of global market share, and growth prospects. The book explores how the rise of intra-industry trade is affecting patterns of specialisation in the region, and appraises the role of multinational corporations and foreign direct investment. Informed by the latest empirical economic thinking, this book is a rigorous examination of the influence of an emerging economic superpower, and the future for economic growth in Asia. Readers interested in the implications of the rise of China, the effect on the economic development path of the most successful developing nations of our time and the lessons to be heeded from China’s integration with the global economy will find this a thorough yet accessible account of the influence of an emerging economic superpower. The role of China in Asia: Engine, conduit or steamroller? The rise of China: New openings for Singapore?